Yes, the tree was dead: it had been cut down (presumably because it had started to rot and fall, and was becoming a hazard for visitors). This created a very acute and emotional reaction by me and the students. At first it was dismay, shock and everyone was full of questions – Why was it cut down? How old was it? What will happen? How long will it take to decompose? Slowly, but in a real and important way, the mood shifted from one of dismay to one of wonder and awe. We began to see that the sun was shining down through the (now) open canopy – there were chickadees chirping and watching our group. 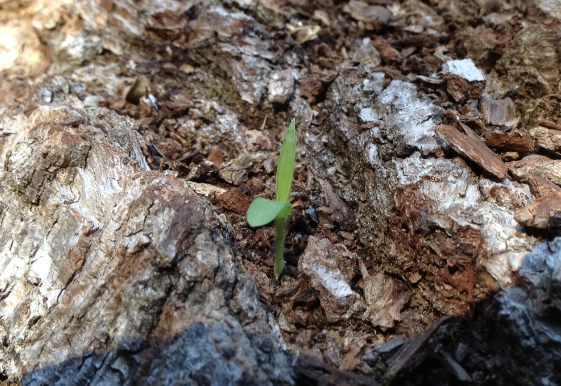 We also noticed that on the bark of the fallen tree a seed had germinated and plant was starting to grow. A seedling from the folds of the dead tree. An opportunity to discuss forest succession, and the dynamic nature of forest ecology. An opportunity to discuss managing a forest for multi-use and the difficulties in thinking about hazards to the public and balancing that with a need to conserve the land. An opportunity to talk about ecological time, land use and development that occurred since the time the oak tree was an acorn. 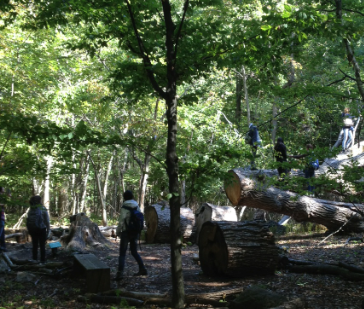 An opportunity to see and feel the microhabitat differences between the dark, damp forest interior and the drier and sunlit area where the tree had fallen. It was an opportunity to discuss forest gaps, and their relative importance in different biomes. In truth, the dead tree provided a much richer field experience than had the live specimen. A learning opportunity, around the tree. These fascinating and unexpected learning opportunities occurred because we were on a field trip. When teaching outside the classroom we cannot always predict what we will see and do. The spontaneity of the event, and emotional reaction to the huge, fallen tree is something we will all remember: The experience will stick. 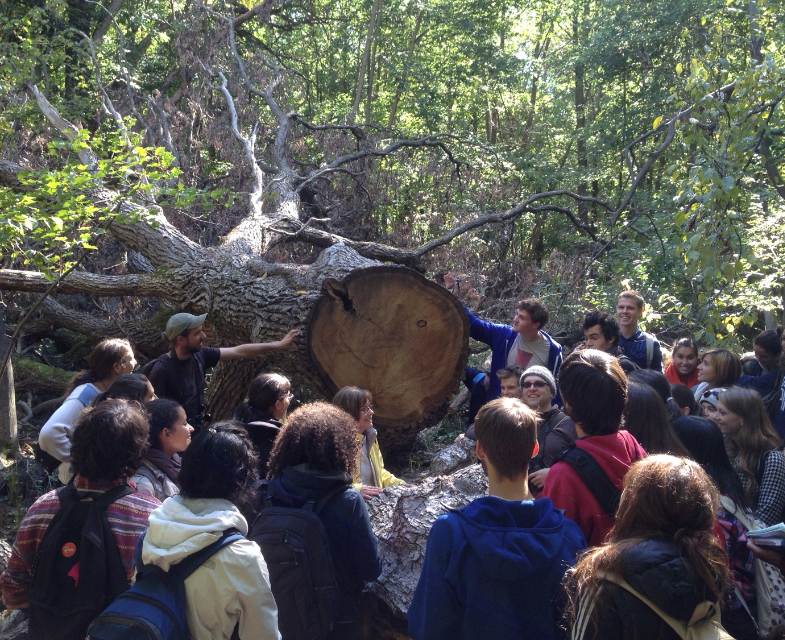 …and those are some more reasons to include field courses in undergraduate education. Make sure somebody goes back and samples the woodboring beetles that will be on it for several weeks next spring/summer! Ted – Indeed!!! great idea – I’m sure there will be some beauties!